$19.95 In stock. Order in the next 7 hours, 58 minutes and it will go out today! In stock. Order in the next 7 hours, 58 minutes and it will go out today! The Professional Buddha Envelopes takes the classic Buddha Papers to a whole new level. Instead of just one transformation, with this new and improved version you can do up to three changes. Turn a blank piece of paper into a dollar, then a $20 and then a $100! How is this possible? AmazeKids’ partner, Nikhil Magic has vastly streamlined the traditional product. Even though there appears to be only three pieces of paper (instead of the usual four), you’ll be able to take advantage of four chambers for transformations, appearances, vanishes and to use as “outs” for a prediction routine. Here are some of the new features you’ll see when you click on the above video and watch Danny Orleans demo it. The side folds have been eliminated, speeding up the magical moment. Four secret chambers which are bigger to hold larger objects. Ultra-thin, even when folded. No more bulkiness. Change blank paper into increasingly larger denominations of currency. Make crayon wrapper change color, again and again. Make a photo of the birthday boy, slowly “develop” right before his very eyes. 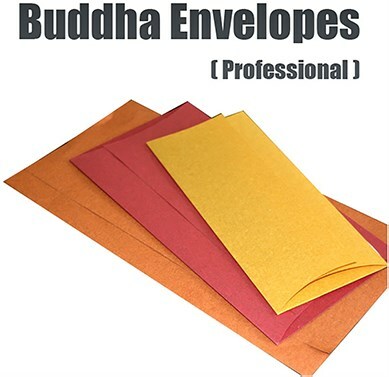 Get the Professional Buddha Envelopes and you’ll have a pocket sized utility prop that packs flat for walk-around or for a birthday party show. There are so many magic trick choices; we think that you’ll have trouble deciding what routine to do first! These papers (envelopes) are well made. I like the sheen on them. I think I was expecting a slightly thicker stock; but it's actually pretty heavy paper and, honestly, much thicker and you run the risk of it not looking as flat and/or working as well. The folding is smooth and straight forward - no fidgeting with multiple folds. The directions have some grammatical errors and are quite brief, (no explanation of, or suggestions for, executing the "secret turn-over" move smoothly and clandestinely; but it's a straight-forward trick and you should pick up how it works just by looking at how it's constructed. You won't be doing this in any strolling environment, as the outside envelope is too wide and long to comfortably fit in any jacket pocket. You also need to use this on a flat surface for it to look and work cleanly. You can use these for multiple prediction reveals during mentalism effects, for magical transformations, "spirit writing", and even as an attention-grabbing moment during a presentation at the office. Use your imagination and these papers/envelopes will serve you well in various situations and will last you quite a while.